A few weeks ago my cousin Dynae had a baby shower for her little one who is due in January. She is having a baby boy and the theme for the nursery is dachshund because they love and own two dachshund dogs. (Ok I had to look up how to spell dachshund and even after typing it three times it still doesn’t look right.) My mom, sister and I went in on a gift all together but I still wanted to give Dynae something homemade. The crafty housewife in me wanted to make her something of meaning and yet be practical. 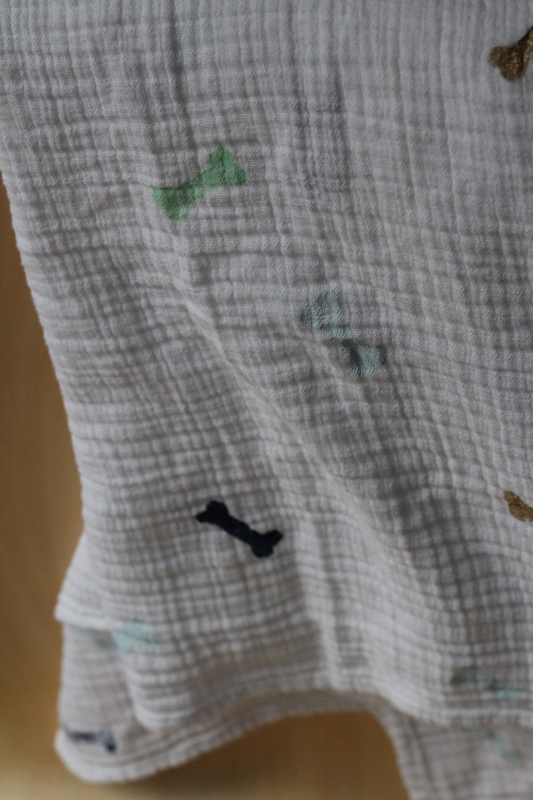 One of my favorite and most used items are my Aden and Anais swaddle blankets. I have seen some dog prints ones, but not ones that seemed to fit the mold for this nursery theme. 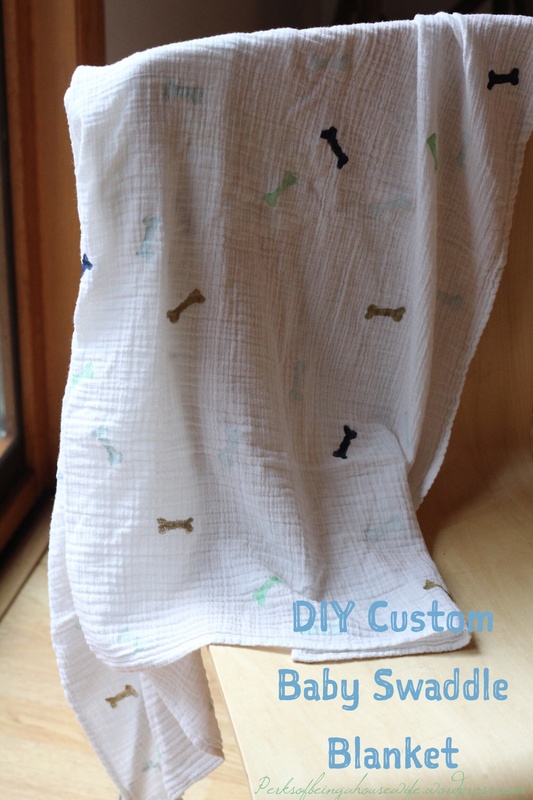 I came across a plain white swaddle and thought to myself- I can jazz this up to be cute and fitting. 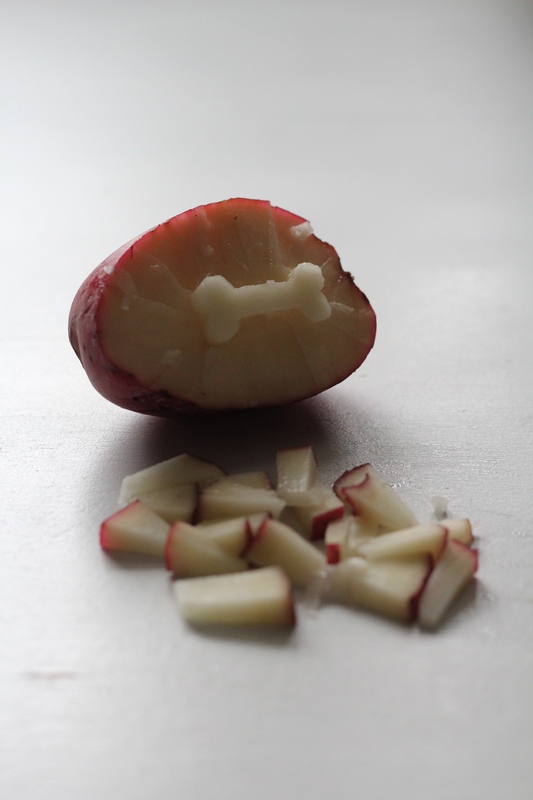 I decided I’d give it go to use a homemade potato stamp and make it dog bone shaped. The result was cute and worth a post. I love how simple it was to create this and it doesn’t take much time either. Here’s how I did it. 2. 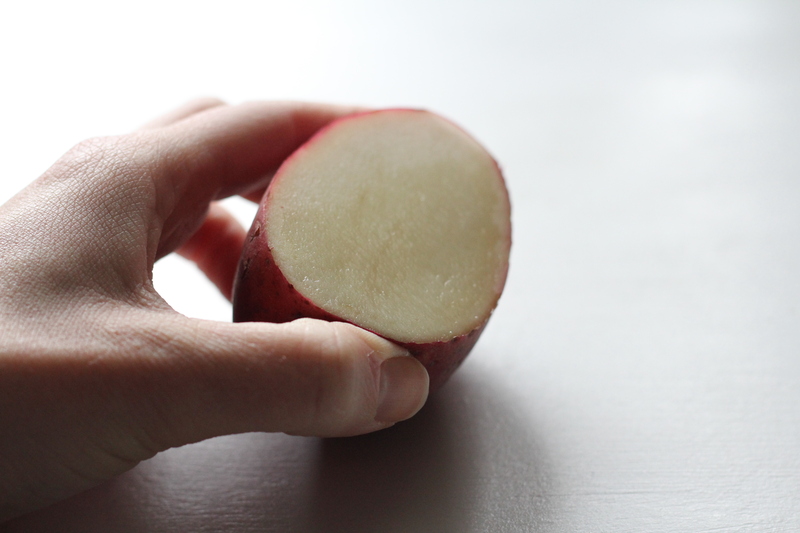 Cut your potato in half making sure it’s nicely flat and even. 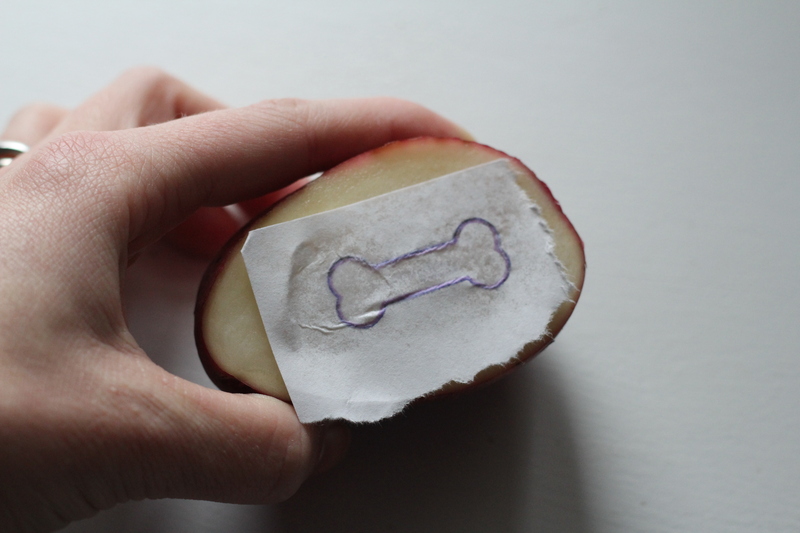 3.Trace your design onto the potato using a pen or knife. I printed out my desired size bone and ran along the design with my exacto knife. 4. 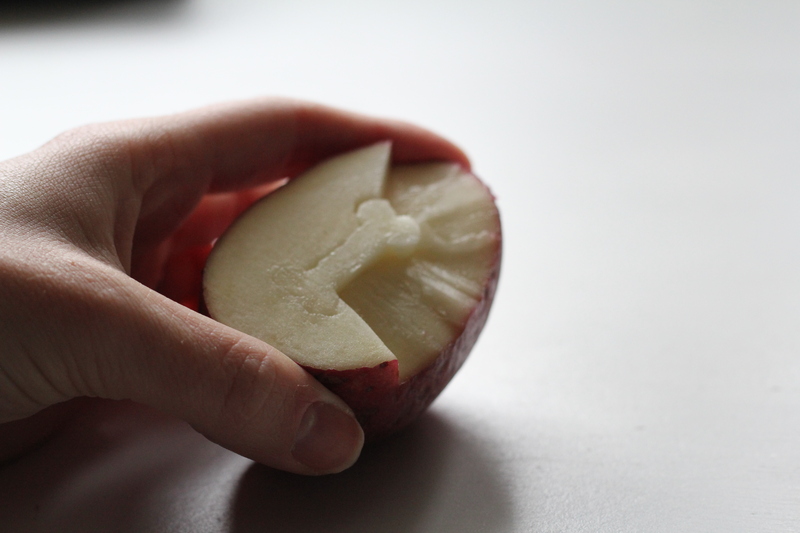 Take and cut down into the potato about a half inch or more and take away small sections at a time all the way around your design. The end product should just be your design. This is how mine looked when it was ready to use. 5. Next have your paint ready to go and brush the paint on your stamp with a paintbrush. 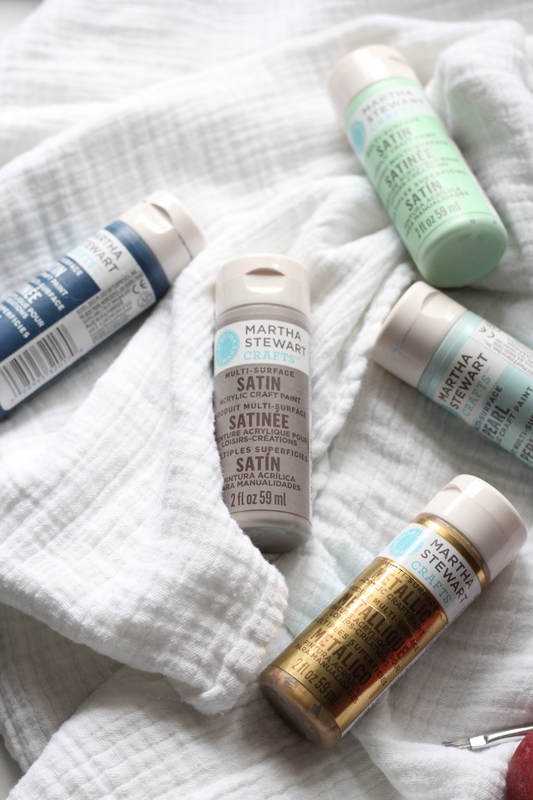 Make sure you liberally apply the paint after each stamp onto the fabric. 6. The rest is up to you! Stamp away until your heart’s content. I chose to use 4 different colors from her nursery to create my swaddle blanket. Lucky for me, I already had these in my supply and I had used them for various baby projects for my Little Mister Myles. 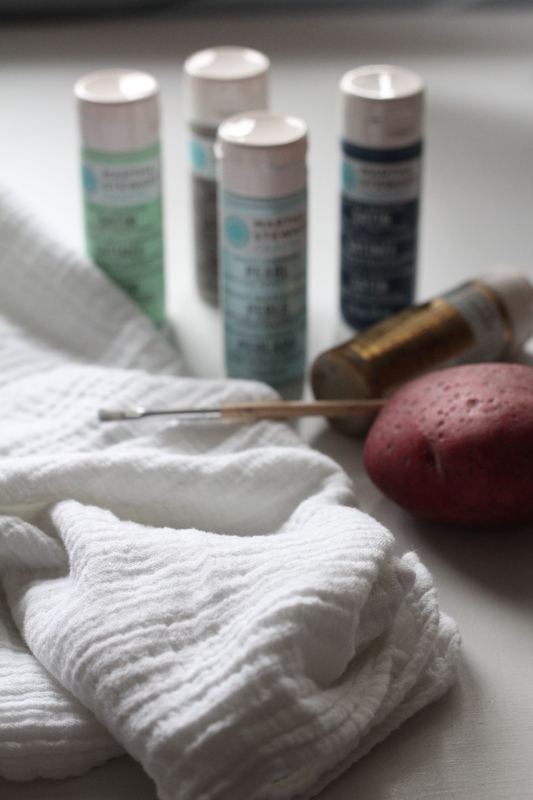 I liked the sheen of the metallic and pearl paints I used and it gave more of a depth to the design of the blanket. The end result was satisfying and adorable. 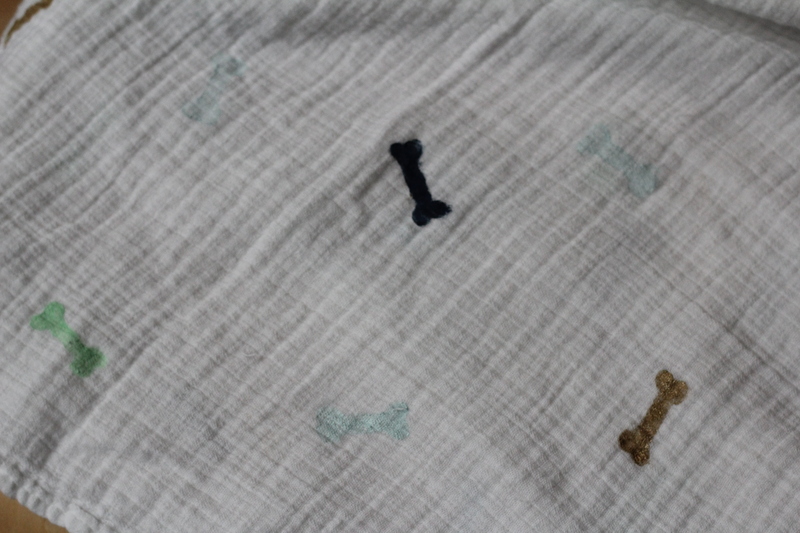 I love how a quick little update really made this plain swaddle blanket be something of meaning for Dynae. May this blanket be used to snuggle and cozy up with that sweet little boy in a few months. Much love and blessing to you cousin! I potato printed an ottoman cover with crosses a couple of posts ago and I’m surprised by how many people are impressed by the oldest stamping procedure ever! I thought everyone did it in kindergarten, lol. Your bones look great! Love how yours turned out too! Thanks for stopping by!